What kind of bird is this. This bird has been coming to my bird feeder for a few days now. 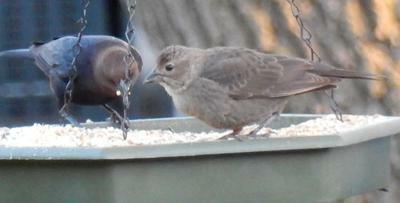 It usually eats with the black bird in photo or with the doves. It flew away with a hi pitched voice. Does anyone know what it is? Comments for What kind of bird is this. This is a link to various photos of the species - Cow Bird.